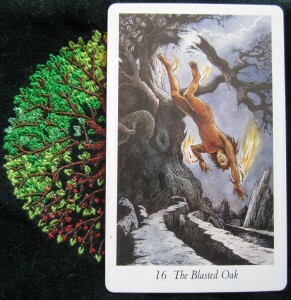 This card shows a man being blasted out of an oak. Parts of the burning tree fall down with him. His sanctuary has been destroyed, uprooted, taken from him. Perhaps he was meant to leave already and he hasn’t. Perhaps he didn’t take the hint that it was time to move on, or Fate is finally pushing him where he needs to be. Which, is not in this Oak.